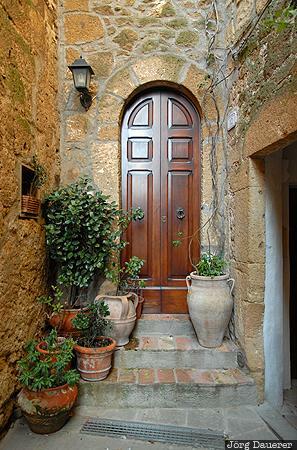 A wooden door and flower pots at the end of a small alley in Pitigliano. Pitigliano is in the province Grosseto in the southern part of Tuscany, Italy. This photo was taken in the afternoon of a sunny day in October of 2009. This photo is part of the exhibition Doors (June 2010). This photo was taken with a digital camera.